How to increase purchasing savings on top of it: go technical !!! Just when you think you have provided all the savings in purchasing, there comes the market and tells you that you have still a gap on cost reduction… And you think… How can I do it ? The answer is go technical. There is a wide range of savings in purchasing that many people do not investigate and it is the cost reduction activities involving product change or redefinition. This analysis is totally on product orientation, not on manufacturing cost reductions. Why don’t you change your product? The idea behind is to review possibilities of cheaper products changing its components (a very simple examples is you sell a book and want to change the cover from wood to plastic, expand this to a more technical extend and you have it !!). Kick off phase: Analyse your needs. It can help an A/B/C on products by purchasing, by volume etc… Think about product complexity and think about market orientation, what makes sense to it (don’t spend any time on 1% products). You might also have to review drawings and/or specification looking for similarities in your products-customers. Phase 2: Analyse and organize information. I hope that you wrote and gathered all the information from the brainstorming. now is time to review between a purchaser and the leading expert what makes sense, what is directly rejected and what can be inmediately implemented. the rest is put in an action plan, organizing activities/ideas in department and areas (transport, materials, etc..) with responsibles and dates with specific activities and leave a box for all ideas (for example changing a cover material will need a benchmarking on costs and materials). It can happen that you discover some new working areas that you forgot ofr the former phase or you need to study again other ones, go back to brainstorming as many times as you need. Phase 3: Start a purchasing action plan. Now that you have all the ideas put altogther, you need to evaluate cost impact and priority. Assig responsibles and actions derived from them, and important dates. Phase 4: Involve the other departments in your activities. Nowadays team working is more important than ever. You might come to points that you need advice, opinion, cooperation, information or even authorisation from other departments. organize meetings or contact directly with them on individual issues. is mus be in parallel to the former phase. Be careful, some ideas deffinitely need to be considered before implementing (for example changing to a material the cover of our book if it is toxic material and we don’t know cause we are not so experts). 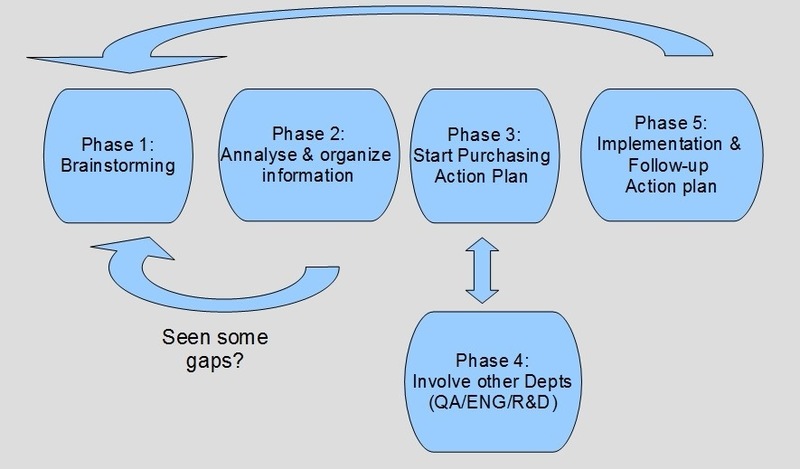 Phase 5: Follow up and implement your acttion plan. Now comes the difficult, how to implement it, well organize regular meetings with your experts and people supporting the plan, review degree of accomplishment of you PDCA. Start with the easy inmediate actions abd always concentrate in strategic projects or customers and big savings volume ideas. In all the cost reduction activities you need implication from the management but also from the people involved, you can and probably will motivate them but they need also to be willing to do it. mprtant also to trust in yourself and the potential of what you are doing and…. go for it !!! ← Paris as an example of continuos battle for CO2 emissions reduction.